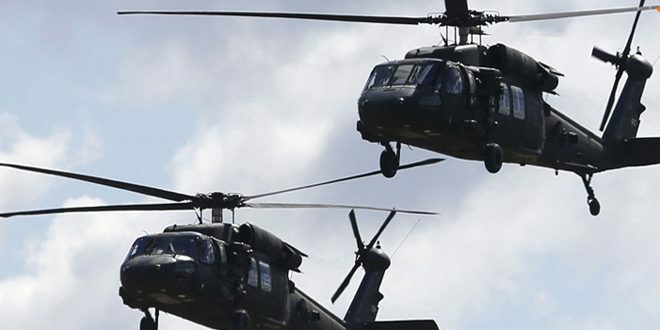 US helicopters airlifted wounded ISIS terrorists from Syria's oil-rich eastern Deir ez-Zor Province on Saturday night according to local reports. Citing local sources Syrian media said that the militants had been relocated from the town of al-Shaafah near the Iraqi border to an unknown location. So nice of Trump regime to rescue terrorists. Too bad this regime didn't think of the innocent people it's so addicted to killing. Since it is apparent that Trump regime wants the Israelis to take over Syria, the US regime flies terrorists into an area to murder people there, then US bombs civilians, when everything is bombed to rubble, Trump regime flies terrorists to another place destined to be destroyed, correct or not? They and their ragtag bunch have to contend with Hezbollah, Iran, and Russian weapons. Hezbollah gained immense operational expertise in Syria. Even commanding some Assad military. They were formidable before, now even more so. All of Israel is in their crosshairs, their estimated rocket strength has gone from 10,000 in 2006 to over 140,000.A good quantity of them precision weapons. Their battle experience went from guerilla asymmetric warfare which they excelled at to including the art of conventional warfare. They and Iranian Revolutionary Guards Corp are the reason Syria was won for Assad. That and a Russian presence which supplied air pummelling and "safe zones"
They didnt kill the Israelis blah blah Atossa bleats. They weren't there to start world war three, they were there to make sure Assad won, along with US/Israel nemesis Hezbollah Iran getting more expanded regional influence. Even in Iraq. LEGAL BY INTERNATIONAL STANDARDS AT THE REQUEST OF THE ASSAD GOVERNMENT. Russia walked a fine tightrope in Syria. The next battle with Israel which is coming, will probably end with the destruction of Lebanon by infuriated Jews who think that only they can bomb other nations with impunity. But Israel will find out that God will not protect them and it will end up in their backyard. It could drag other states like Turkey in to it. Former Secretary-General of Lebanons Shia Hezbollah movement, Subhi al-Tufayli, has praised Turkeys policy in the Middle East region. Turkey is the only country that cares about Syrias security and unity and its foreign policy is in accordance with the expectations and will of the Syrian people, al-Tufayli, 70, said in an exclusive interview with Anadolu Agency on Sunday. Turkey announced that they would refuse any sort of foreign interference in Iran and emphasized that peace and social stability should be preserved in its neighbour, he said. Edited by redline, 26 February 2019 - 05:03 PM. USA possessed of that same mentality as Israelis appear to be. If Israelis want to be Israel, they should follow the Divine Mandates that Israel was to be a blessing to the Nations. But, they refused and in Isaiah 65:15 their name became a curse word. So if they want to stop being a curse word, they Must follow the King of all kings, Yahshua, Messiah, Christ. Yes and the disgrace is my Country has just listed Hezbollah as terrorists,they caved in to the Zionist inside my Country and Parliament,its Orwellian,peace is War and War is peace. Edited by Mario Milano, 26 February 2019 - 06:51 PM. Anyone who militarily can challenge Israel are "terrorist". Even Palestinians with slingshots which the IDF prefer to fight. I agree, its complete. Owned, told what to think, bought, they rule our governments who rule us. Ironic that the real "freedom fighters" today are organizations like Hezbollah fighting against the snake that emanates out of the "holy land". Edited by redline, 26 February 2019 - 10:25 PM.